Circus Themed Combo 4n1 Standard - For the size of a normal jump house you can have it all! Do more than jump. This awesome 4 in 1 unit gives you plenty of jumping, basket ball hoop, 'rock wall' climb and an amazing fast slide all inside a unit the size of a standard 15'x15' bounce house! . In the bounce, they can jump or shoot hoops. The bounce area is 115 square feet so there’s plenty of room for fun. But there is more. . . the fun doesn’t stop! Kids will love 'rock' climbing up to the top of our 13’ Slide. Then they will experience the tallest Combo Slide in the Industry, with a 50 degree sliding angle! What a thrill! What a rush! Slide is completely enclosed for safety. Combo needs a 18’ x 18’ area for set up. Recommended for children 5 to 10 years of age. Children must be at least 42' tall to enter and 12 years of age or under. A maximum of 8 children may play at one time. Air Castle inflatables are not designed to handle adults. This complete unit rents for a full day! While others get just a bounce house you can get the upgrade for your party - a 'rock wall' climb, slide and basket ball hoop!! Available in all themes, ask for details! Air Castles And Slides, LLC 908-222-1111 AirCastleRentals.com o. 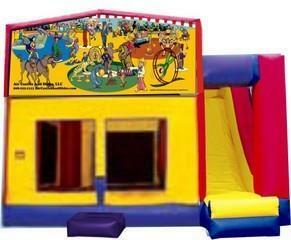 Circus Themed Combo 4n1 Standard - For the size of a normal jump house you can have it all! Do more than jump. This awesome 4 in 1 unit gives you plenty of jumping, basket ball hoop, 'rock wall' climb and an amazing fast slide all inside a unit the size of a standard 15'x15' bounce house! . In the bounce, they can jump or shoot hoops. The bounce area is 115 square feet so there’s plenty of room for fun. But there is more. . . the fun doesn’t stop! Kids will love 'rock' climbing up to the top of our 13’ Slide. Then they will experience the tallest Combo Slide in the Industry, with a 50 degree sliding angle! What a thrill! What a rush! Slide is completely enclosed for safety. Combo needs a 18’ x 18’ area for set up. Recommended for children 5 to 10 years of age. Children must be at least 42' tall to enter and 12 years of age or under. A maximum of 8 children may play at one time. Air Castle inflatables are not designed to handle adults. This complete unit rents for a full day! While others get just a bounce house you can get the upgrade for your party - a 'rock wall' climb, slide and basket ball hoop!! Available in all themes, ask for details! This Air Castles And Slides Themed 4in1 Combo STANDARD inflatable has Bounce Jump House, Basketball hoop, Rock Wall Climb, and Steep Slide in over 128 different themes (licensed, classic, original, and traditional)! Be sure to pick the best theme for your party! See category 'Popular Themes' for photos of all themes listed below. Minimum rider height is 40.0". Slide may NOT be used as a water slide. Here is the list of over 128 Inflatable Classic Themes, Original Art Themes, Licensed Inflatable Themes include; Aladdin, Autumn Harvest, Ballerinas, Bambi, 'Bladin', Boardin' & Bikin' , Blues Clues, Boys Will Be Boys, Brother Bear, Carnival Party, Celebration, Christmas, Church Community, Circus Fun M/L, Dinosaurs, Disney Beauty Beast, Disney Cinderella, Disney Finding Nemo, Halloween Dracula, Disney Lilo and Stitch, Disney Lion King, Disney Little Mermaid, Disney Pocahontas, Disney Princesses, Disney Sleeping Beauty, Disney Snow White, Dora, Fall Fabulous, Fairy Forest Friends, Fire Truck Rescue, Fire and Rescue, Football Rutgers vs Princeton, Girl Thing, Happy Bday Animals 5 M, Happy Bday Babies, Happy Bday Boy Med, Happy Bday Clown9, Happy Birthday Curious George, Happy Birthday kids 3, Happy Birthday photo, Horses, Hulk Attack, Incredibles, Lets Party, Looney Tunes, Madagascar animals, Monster Truck Madness, Monsters Classic Movies, Noahs Animals, Patriotic - Land of the Free, Peter Pan Wendy Hook, Pirates, Power Rangers, Princesses Ethnic, Racing Cars, Robo Car, Saint Patrick's Day Carnival, Scooby Doo, Seaside Beach, Shrek, Space Kids, Spider Man, Spring Kids, Sponge Bob, Sports Balls, Sports Kids Play M/L, Strawberry Shortcake, Superman, Thanksgiving Med, United We Stand America, World of Warriors & Wizards, Western fun Cowboys, Winnie T Pooh, Zoo.